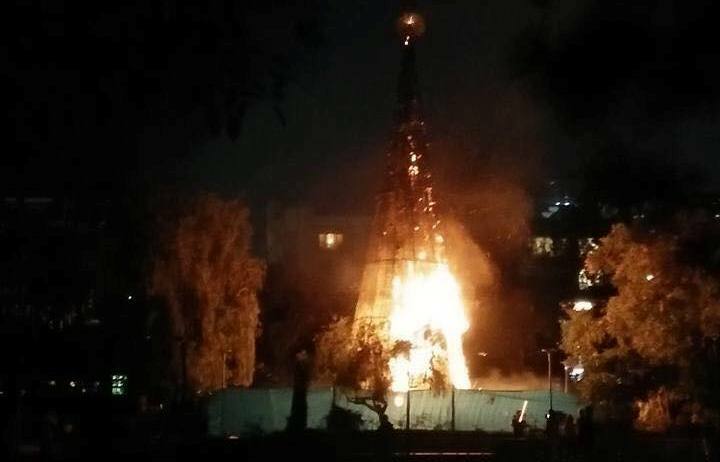 The giant Christmas tree installed at the center of the Rose Garden in Burnham Park is now a goner. It was reduced to ashes on Tuesday night in what is believed to be a case of arson. According to some witnesses, at least two men were seen running away from the fiery scene. Investigators are also not discounting the possibility that the fire may have been caused by faulty electrical wiring. The artificial tree is wrapped with Christmas lights, balls, and other decorations that are powered by electricity. However, a security guard posted in the area said that city employees started removing Christmas decorations in the area the day before the tree burned down. Around 8:50 in the evening, the Bureau of Fire Protection received an alert call from an employee of a hotel near the garden that the tree was on fire. Several minutes later, nothing was left of the tree except for its metal framework.